Are you searching for a vacation rental somewhere in between a small hotel room and a larger beach home this year? 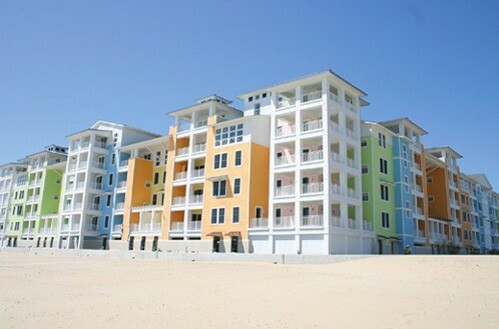 A fully furnished Virginia Beach Condo can be the perfect solution! Condominium units are much more roomier than a hotel room, and offer full kitchens and range from 1 - 4 bedrooms. Some 4 bedroom units even accommodate up to 10-12 people for larger groups and families. There are many upscale Condominium complexes in the Virginia Beach area (see below). Whether it be a condo at the busier resort area... or perhaps one located in the more tranquil, secluded area of Sandbridge Beach, we've got all the bases covered! So this year, why not consider a condo? They offer a good value for your vacation dollar! Check out the resort Timeshare Condos that offer all the benefits of a Condo Rental with resort amenities to boot! 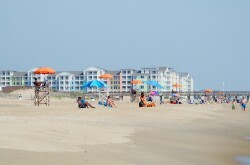 Oceanfront condos in the heart of the Virginia Beach resort area offer vacationers a fantastic view of all the exciting activities along the Boardwalk. It's fascinating to watch folks stroll, jog, rollerblade, skateboard, bike, sunbathe, surf, swim, fish, laugh, and simply enjoy "The Good Life" along the beach and boardwalk. There are also tons of special events, live bands / concerts, art shows, sports championships, and beach festivals going on throughout the year, so it's a perfect location to see it all... while having the the great Atlantic Ocean as your backdrop. Condo life also gives you the option of simply kicking back and relaxing. If you unit is on the oceanfront, imagine lounging in your living room or balcony while witnessing a perfect sunrise each and every morning. What a great way to vacation... beginning each day with a sense of renewal and possibility. Take in the salt air... amuse yourself watching the dolphins play in the surf... or marvel at the lines of pelicans, seagulls, and even the occasional parasailer soaring overhead. Take a dip in the ocean or enjoy the many resort amenities offered whether it be an indoor pool, outdoor pool, sauna, fitness room, hot tub, or nearby restaurants and attractions.